Van Hool has signed a contract to build two hydrogen buses for TfL. The deal falls within the scope of 3Emotion, a European consortium on Hydrogen Fuel Cell Buses, in which Van Hool is acting as project coordinator. The hydrogen powered 12m hybrid (fuel cell and battery powered) Van Hool A330 is equipped with the FCvelocity-HD7 Fuel Cell module from Ballard Power Systems in Vancouver, Canada. It has 35 seats, space for one wheelchair user and standing room for 30 passengers. The vehicles will be used on Tower Transit operated route RV1, which runs between Covent Garden and Tower Gateway. The hybrid drive system will enable the buses, with a tank content of 30 kg of hydrogen onboard, to travel the planned daily distance of 300km for TfL. Running entirely on electricity, the drive system is based on fuel cells, lithium batteries and electric motors. A year after launching its EX coach range, Van Hool has already sold over 100 of them. Customers from Belgium, Germany, the UK, France, Italy and Switzerland have invested in the vehicle which is designed for a wide range of applications, from long journeys to intercity trips and scheduled services. 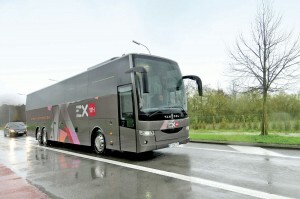 The previously introduced EX15 H and EX16 M were recently joined by two more tri-axle coaches in the EX range: the EX16 H and the EX17 H. The EX is based on what the manufacturer describes a flexible modular design, which it says can be used to build vehicles to suit a wide variety of applications. It is configurable as either a dual or tri-axle coach with a generous luggage compartment and up to 65 seats, optional toilet, narrow or wide middle door and wheelchair lift. The EX is powered by a DAF MX11 Euro6 engine (394hp or 436hp) and comes with a comprehensive range of safety features. It was designed and developed at Van Hool’s parent company in Koningshooikt, Belgium and is manufactured at the production facility in Skopje, Macedonia.